Continental Groove Thing | What the Craft?! While knitting N’s socks, I had a breakthrough in my continental knitting style. 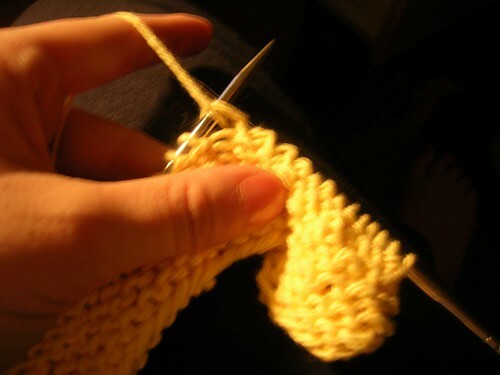 When I learned to knit, I learned the traditional (American) way, holding the yarn in my right hand. Then, while taking a sock class with Kari, I met a couple really neat knitters who were SO FAST while making their socks. Watching them closely, I saw they were holding the yarn with their left hand. Continental knitting, one of these amazing women explained to me, as her hands handled that yarn like Dash from the Incredibles, zooming through her sock project at warp speed. So the week between classes, I determined to learn continental (translation: speed knitting, for us Type-A knitters). I got onto knittinghelp.com, and slowly learned this backwards-feeling method. I would have quit for sure if it had just been a theory, because it felt so awkward, but I had seen with my own eyes the speed when it was done right. Well, I did manage to teach myself to knit continentally, but (silly me) I did it on the second sock of that project. As a result, I had one normal-ish sock and one very-loosey-goosey-new-methodly-knitted sock. Normally, I am a very tight knitter. (Result of my type-A personality, no doubt). But this continental method was So Loose. After that project I sized-down my needles to get the right guage. Now, if you’ve followed this blog for awhile, you know that by this point, I’d made two pairs of socks that Just Are Not The Same Size. The first pair was mismatched because I was getting used to those blasted giant toothpick dpn’s and it was my first lesson in Tension. The second mismatched pair was the intro to continental knitting, which was made during my sock class with Kari, who chronicled her journey with the Stupid Sock from that class through a series of hilarious posts. And now there’s N’s latest pair of socks. Mismatched Pair Number 3. See, what happened is somewhere near the end of the first sock, I got my groove regarding continental knitting. Seriously, it FINALLY became easy and all of a sudden, there was my guage again, just like with the American knitting method. How refreshing to be all (up)tight again. The problem, of course, is that the first sock was almost finished and the second sock was made with an entirely different guage. I toyed with the idea of ripping that first sock out and doing it over again, but even I couldn’t bring myself to do that. N is still pretty happy, and I figure I can always semi-felt the suckers if they get pulled too far out of shape. But the problem with My Continental Groove does cut a little deeper. See it affects…The Husband. The Husband’s Sweater. I started this sweater months ago and set it aside because frankly, it just got to be So Boring. This was all fine, until I got my groove. Now, I’m going to get to finish this sweater while trying to ungroove my groove. I know I could just change needle sizes, but what fun would that be really? Okay, you have got to be kidding me!?! I even went to the site to check out the specific style mentioned and ha! That is like Greek to me, Friend! So…Those are wonderful socks! You just must not know how impressed I am over here about those socks!! They are PERFECT as far as I can see and in my opinion, the camera tends to show more than it is forgiving so I go on record saying that I think the socks are GREAT! Tony-the-Tiger-style! !